Started up a new daily workout routine last week. I noticed something interesting on Day 2. Although I was sore from starting up working out again, I found myself being more active throughout the day. I was more inclined to chase my 3-year-old around the house, for example. When I wasn’t working out, it was almost like I knew that if I ran a little bit, I’d remember that I need to do more of that. So I stayed as still as humanly possible most of the time. Working out made me more likely to work out. Being fat made me more likely to be fat. Aaaaannnnd…working on music makes you more likely to work on music. I was talking to a buddy last night who is feeling some guilt about not pursuing music as much as he thinks he should. He has all these ideas and ambitions, but he’s slow to act on anything. The fear of failure is insanely strong. And the train pulls into Procrastination Station. Whatever it is that you want to do — write songs, record guitars, mix — the only way to do more of it is to (and this may come as a shock) DO MORE OF IT. 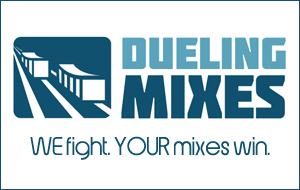 If you really feel drawn to mixing, then Dueling Mixes is the perfect place for you to put your money where your mouth is. For less than a dollar a day, you’ll have everything you need to start mixing more (and mixing better).